Lee came to the Cambridge studio to design a unique eternity ring for Suzanne. Lee had a very good idea of the style of ring Suzanne would like. He also knew she would like to wear it on her right hand so her design needed to make an impact. We have redesigned Suzanne's grandmothers eternity ring, using her diamonds and very dark sapphires. 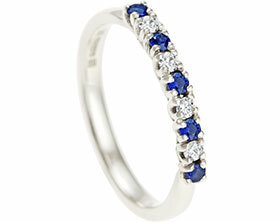 To add some colour we have used two lighter blue sapphires. All the stones have been set into palladium four claw settings. The gnelty curved band tapers from 3.5mm at the back and sides of the ring towards the stones. To add to the sparkle we have given Suzanne's ring a polished finish.